BCE Inc. says it will ask the federal cabinet to intervene after the CRTC rejected its proposed $3.4-billion takeover of Astral Media - but the government says it has no legal ability to overturn the decision. BCE Inc. said it will ask the federal cabinet to intervene after the CRTC rejected its proposed $3.4-billion takeover of Astral Media, saying it would place too much power in the hands of one company and threaten the competitive media landscape in Canada. "BCE failed to persuade us that the deal would benefit Canadians," said Jean-Pierre Blais, chairman of the CRTC, in a statement explaining the commission’s decision to block the bid. "It would have placed significant market power in the hands of one of the country’s largest media companies. "We could not have ensured a robust Canadian broadcasting system without imposing extensive and intrusive safeguards, which would have been to the detriment of the entire industry." BCE issued a press release Thursday night saying the CRTC's decision should not stand. "[BCE] is appalled that the CRTC would come to a decision that so negatively impacts Canadian consumers and the national broadcast industry, contravenes its own policy and is tainted by behind the scenes lobbying by Bell's cable rivals," the release stated. In the House of Commons Friday, Paul Callandra, parliamentary secretary to Heritage Minister James Moore, said "there's no legal ability for cabinet to overturn this decision." The proposal was one of the biggest takeover bids ever submitted to the CRTC and the first major decision for Blais, the newly installed commissioner. The deal would have meant that BCE owned in total 107 radio stations, two national television networks and 49 pay channels. In radio, it would have become the largest commercial radio operator in Canada, with more than 25 per cent of commercial revenues, and bigger than the second and third largest rivals together. Blais said BCE made no commitments on local programming or the promotion of emerging local artists. The CRTC said BCE — owner of Bell Canada, the CTV television network, numerous specialty TV stations and the former Chum radio stations, as well as being the largest internet service provider in Canada — already has 33.7 per cent of the English television viewing audience, well ahead of its nearest rival, Shaw Communications, with 21.9 per cent. Had it succeeded in acquiring Astral Media's 25 channels, including The Movie Network, HBO Canada and French-language Super Ecran, Family Channel and Disney Junior and more than 80 radio stations into the BCE fold, it would have gained 42.7 per cent of the English viewing audience. The combination would also have given it 33.1 per cent of the French TV market. BCE/Astral would control "unprecedented" English TV revenues and audience and would increase its "already significant" share of must-carry services, giving it "considerable negotiating power" with other distributors. Deal would increase BCE's presence in movies, sports and premium content that feature exclusive and/or live programming unavailable elsewhere. Combined ability to negotiate program rights and "bulk buy" could reduce competition. Given BCE's significant position in Canadian broadcasting, it did not demonstrate a need to be bigger to compete with foreign services. Safeguards required to address CRTC's concerns "would be extensive and unduly burdensome." CRTC wasn't persuaded the deal would provide enough benefits to balance its concerns. "That convergence, integration and scale may lead to a point at which the size of an entity on a national level becomes so large that it hinders effective and healthy competition," the regulator said. Rogers commended the CRTC for its decision, which it called "courageous." "I was very surprised," independent analyst Gavin Graham of Graham Investment Strategies told CBC News. "The expectation here was fairly widespread they would approve it with some restrictions." 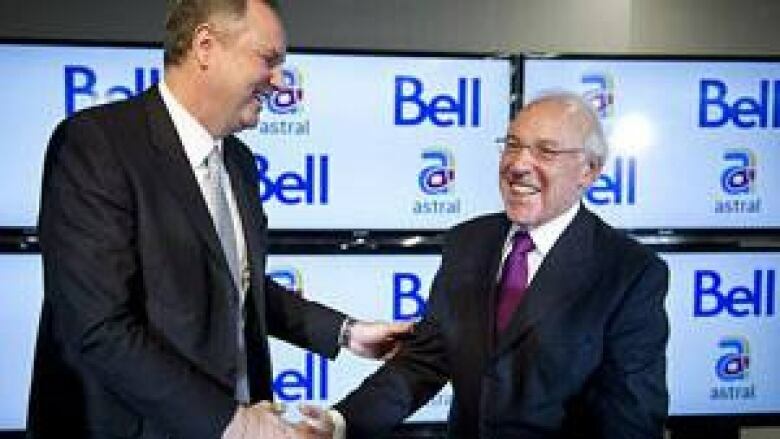 Astral is still for sale, Graham believes, so an offer from a consortium of communication companies with a pre-arranged plan for sharing the assets might be something the CRTC would be willing to accept. Telecom analyst Iain Grant said the CRTC hasn't delivered a ruling of this magnitude since 1992 when it approved competition for long-distance calling. "This is a defining moment for the CRTC," said Grant, managing director of the SeaBoard Group. "They have stared at Canada's largest corporation and one of the largest deals in Canada and said no." In public hearings last month, BCE officials said the acquisition still left sufficient "diversity of voices" in the broadcasting system, and pledged tangible benefits by adding $200 million in funding for programs. The CRTC said in its decision that combining the two companies would have created a situation where a company of BCE's size and scale would be able to exert its market power unfairly. The decision was a blow to BCE. It had argued it needed to expand to take on foreign competitors like Netflix. In its decision, however, the CRTC said BCE did not demonstrate that it needed to be bigger in order to compete. The decision will be welcome news for BCE’s competitors. Rogers, Telus and Quebecor all opposed the deal. They argued it would give BCE too much control over the country’s broadcast sector. Opponents had run a campaign of television, newspaper and online ads to bolster their case that the BCE deal would ultimately harm consumers. Calgary-based Shaw Cable had supported the deal. BCE accuses the CRTC of allowing senior officials to meet with cable companies multiple times in the days before the commission began public hearings on the takeover bid, but denied BCE any such consultations. The company said that calls "into question the impartiality of the entire process." CRTC rulings can be appealed within 30 days to the Federal Court of Appeal.